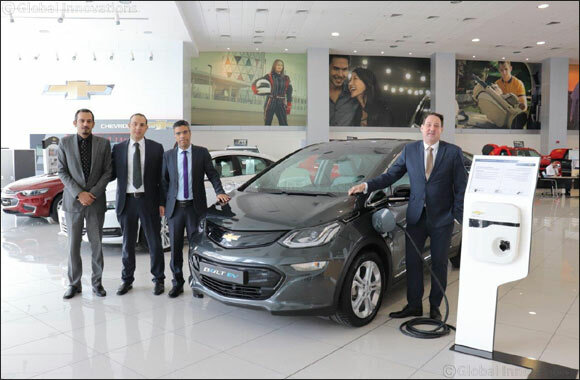 Dubai, UAE, June 11, 2018: Following its recent release in the US, the innovative electric vehicle, Chevrolet Bolt EV, is now available in the UAE market, announced Al Ghandi Auto, the leading General Motors automotive dealership that sells Chevrolet and GMC vehicles in Dubai and the Northern Emirates. The launch of the most affordable electric vehicle in the UAE market is aligned with the Dubai government's sustainable mobility strategy, as envisioned and outlined by His Highness Sheikh Mohammed bin Rashid Al Maktoum. “We remain firmly committed to creating a sustainable landscape in future mobility, and the launch of the Chevrolet Bolt EV in Dubai and the Northern Emirates signifies our relentless efforts to bringing innovation that complement the direction of the Dubai government in building a Smart City and in increasing the availability of zero emission vehicles in the UAE,” commented Mark Jenkins, CEO, Al Ghandi Auto Group. The all-electric Chevrolet Bolt EV is set to be the go-to vehicle for customers who are on the lookout for a sustainable car that combines a spacious interior for five passengers and up to 1.27L of cargo space, with a host of advanced technologies designed to help them along their journey. “In addition to Al Ghandi Auto's 8-years/160,000 kms battery/motor warranty, the new Chevrolet Bolt EV comes with the electric vehicles incentives that include: exemption from SALIK tag fee, unique number plate sticker, free assigned parking spots in 40 locations, and free e-car charging at over 200 stations until the end of 2019,” emphasized Mr. Jenkins. The Chevrolet Bolt EV makes no compromise on performance, delivering 0 to 100 km/h in 7.3 seconds, an estimated 520 kilometers on a single full charge, and 204 horsepower.